Clyde Dupee ain’t good looking, but he is intelligent, funny and quite devastatingly charming. He’s also a thief, a jailbird and an alcoholic with a tragic past. Neverthless, prissy former beauty queen, Tharon McGee, falls head over heels in love with him. Both are convinced their love will give them the happy ever after they’ve been looking for; continuing to believe it even after Tharon has to pull a back-sliding Clyde out of the bar shortly before their wedding. Will true love win the day? Or will Clyde’s demons destroy their relationship? What a strange and delightful book “Show Me The Way” is. 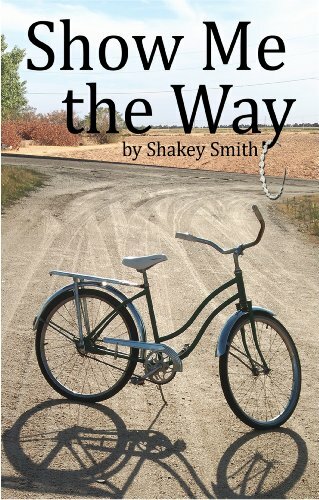 Short on plot, huge on voice, it’s a charming love story, a tragicomedy and a love letter to Kansas all wrapped up in one. Along with Clyde and Tharon, the story is filled with a large number of interesting characters, some lovable, some crotchety, all fascinating. I’ve always been at a bit of a loss to describe Shakey Smith’s writing. Erudite, but down-home. Hilariously funny, but so bittersweet. Painful, but full of so much joy. In the end there’s really only one word: unique. There are a couple of issues that prevent this from being a five star review. First, the huge cast of characters was difficult to keep tabs on. A family tree or list of characters would have been hugely helpful. Second, the ending seemed a bit rushed to me. I would have liked a longer drawn-out ending, so that I could have closed the book completely satisfied (or maybe I just didn’t want the story to end.). Full disclosure: I have had the privilege of being a reader of Ms. Smith’s unpublished stories. I am, in fact, her fan and her critic. Having read several of her other stories I know that “Show Me The Way” is but one square in a body of work that, brought together, comprises a quilt: generous in size, beautifully stitched, each square fitting perfectly into the whole. It’s a remarkable body of work. I look forward to more stories from her. This entry was posted in Book Reviews, The Book Pile. Bookmark the permalink.